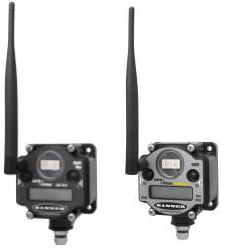 The Banner SureCross® industrial radio devices provide reliable wireless environmental measurements without the need for costly wiring. Users can choose between star (-P6 Performance) or tree (-H6 MultiHop) RF topologies, enabling flexible deployments and maximum coverage. The Banner SureCross® Temperature and Humidity Solution can be built on either the Performance platform or the Modbus MultiHop platform. Supplementary, 900MHz frequency versions allow for 1 watt RF power output and maximum signal integrity used in-facility. Both the SureCross -P6 and -H6 feature a single internal D-cell lithium battery which is easily replaceable and provides up to 5 years of life. Each radio features multiple configuration options and an LCD display for user feedback and troubleshooting. When combined with the M12FTH4Q temperature/relative humidity sensor or the M12FT4Q temperature sensor, the Banner SureCross P6 & H6 can offer unprecedented flexibility, reliability and power management in an industrial environmental monitoring solution.